Australia, whose economy has been driven by “resource bonanza”, is now Japan’s biggest coal supplier. At the same time the impacts of Australia’s coal industry include depopulation as well as water depletion, farm land fragmentation and health problems. Boggabri is one of those communities that have been affected by the country’s coal industry expansion. 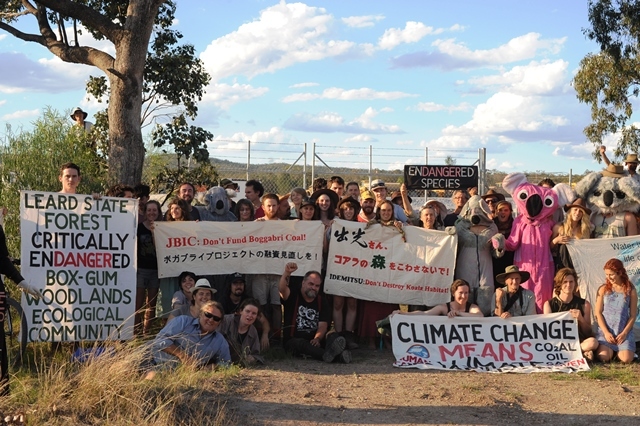 Idemitsu’s Boggabri Coal Mine has being expanded within Leard State Forest, located near Narrabri in north-west NSW. The mining expansion would give crucial influences not only to the biodiversity there but to Aboriginal and non-Aboriginal community members and families. We JATAN urge Idemitsu Kosan to stop the expansion immediately and also ask JBIC (Japan Bank for International Cooperation) to review the decision that they have made to fund the Idemitsu project. Leard State Forest is the largest piece of native vegetation in the Liverpool Plains, home to a large tract of White-Box Gum Woodland, a critically endangered ecological community, and many threatened flora and fauna including swift parrot, greater long-eared bat and koala, a national icon listed as the country’s endangered species. The indigenous inhabitants of the Liverpool Plains are the Gomeroi (also spelt Kamilaroi) people, who have lived in the area for at least tens of thousands of years, forming the oldest continuing culture on Earth. A group of Gomeroi people filed an application for a native title determination for the area including many mining company sites like Boggabri. They are concerned that mining projects could destroy their sacred sites within Leard State Forest. Idemitsu started coal production at Boggabri in 2006 and have expanded their production since 2010. Idemitsu Boggabri achieved coal production of 3.7 million tons in 2012. JBIC signed a loan agreement amounting up to 350 million U.S. dollars with Idemitsu Australia Resources, an Australian subsidiary of Idemitsu Kosan in the aim of contributing to securing stable supply of mineral resources to Japan. What we are concerned about is that JBIC’s loan decision may be incompatible with some articles of their “Guidelines for Confirmation of Environmental and Social Considerations”. For example, Idemitsu’s proposed offsets and rehabilitation plans may be fundamentally inadequate in the reference of the pertinent section of JBIC guidelines (Page 13). And also the Gomeroi group claim over their native title will show that Idemmitsu’s efforts to obtain prior informed consent of indigenous people may not be well organized despite “Indigenous Peoples” stipulation of the guidelines (Page 15). 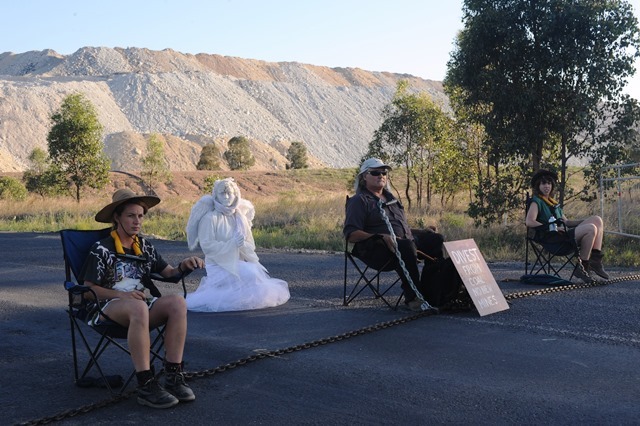 On September 16, 2013 a group of local-based activists and farmers called the Northern Inland Council for the Environment (NICE) launched a legal challenge in the Federal Court against Whitehaven and Idemitsu’s plans for major new mines out at Maules Creek .